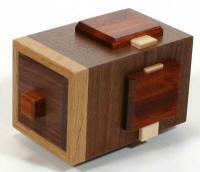 Hiroshi Iwahara Do you know the product "CUBI" ? It was made by my boss, whom I greatly respect, Mr. Akio Kamei. 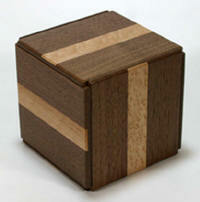 It's a CUBE box that has BINARY motion. It's one of the most difficult Karakuri to open. I was impressed by this box, and was determined to create Karakuri. Complex mechanisms and simple expressions produce functional beauty. I'll create those products. There are 2 white layers of Rings. When you move the rings correctly you will be able to open the drawer. There are 8 arrangements depending on the position of the 2 Rings. There are several ways of opening it. But, when you go through the shortest routes, the Rings move like a dance. This item was designed as a developed version of RF-16 “Covered Chimney”. One by one you slide each tree-plate in turn. The only plate without a tree is the goal. As you slide each plate in the correct order, you will begin to feel that you can open the final lid. But it’s not that easy! 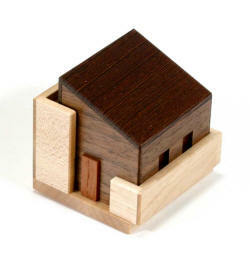 This is an item using gravity, such as, “Box with a tree” in 2005, and “House with trees” in 2010. 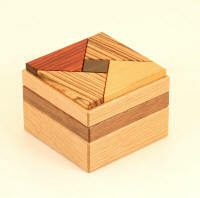 If you know these products you may be able to manipulate the puzzle more easily. “Is it possible to make items of system such as Binary or Ternary with a very clear design?” I wondered about this so I decided to try and see if I could do it. There are only 3 “drawers”. It is the minimum number that we need to fully enjoy the system. There are only 2 devices. When you have solved the puzzle, you can finally open the bottom drawer. The mechanism used for RF-38 “Canon Chest” was used. This is a drawer of Quinary system. It takes 50 moves to open (except for opening the lid). When all the 3 “drawers” are opened, you can open the bottom drawer. The number of moves has increased in this work. As might be expected, it will take time to solve this item. The formula to calculate the number of moves is “5*5*2=50”. Well, how about the formulas of other items? This is a drawer of Quaternary system. It takes 32 moves to open (except for opening the lid). When only the left “drawer” is opened, you can open the bottom drawer. You can find the “Comb”-shaped groove that also appeared on the RF-28 “KING CUBI” device. At first glance, the groove looks like it is a shortcut. And as you move the parts it works well. Please experience the wonder. 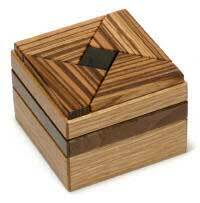 This is a drawer of Ternary system. It takes 18 moves to open (except for opening the lid). When all the 3 “drawers” are opened, you can open the bottom drawer. 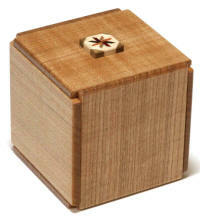 RF-4 “Super-CUBI” has 6 sides, and it has many more moves. In fact, only 2/3 of the performance is used. But, the performance is fully utilized on this item. The maximum moves are 3 “drawers”. This is a drawer of Binary system. It takes 8 moves to open (except for opening the lid). When only the left-side “drawer” is opened, you can open the bottom drawer. I think this item may be the easiest item to understand the binary method. When you maneuver this while looking at the window, you will understand the binary method easily! All of the beautiful Yosegi is actually part of the Karakuri. The design perspective is of the viewpoint taken from above and looking down. 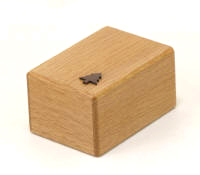 The shape of the cube and the corresponding position is the hint to opening the drawer. The design and Karakuri were linked in a virtual image. The title is from the Yosegi of RF-8. 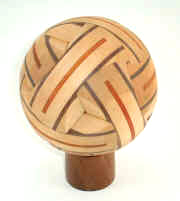 On the design, Yosegi was used as the device. So, if you move the device while regarding them as islands, it may be helpful if you think of the tour of the islands at Matsushima, Miyagi, a tourist spot. 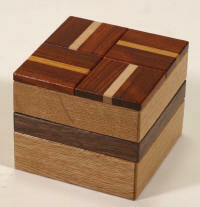 Material : walnut, magnolia, padauk, keyaki, etc. 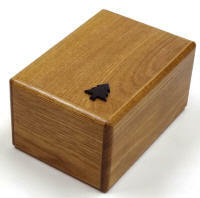 The Christmas present for the previous year, RF-49 “Bean Bag Drawer 3 (Cat's bell)” was somewhat difficult to solve. So, this year, I tried to use a simpler idea. There are two spaces in the drawer. The second space is locked. When you move the device on the top with the drawer, you may figure out how to solve it. The gimmick is different from RF-55 “Aquarius Drawer (5 devices)”, but, I intentionally used the same name. This might be one of the clues to solving it. This was the goal. 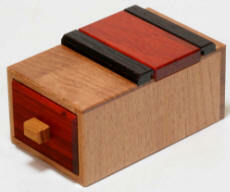 He made Secret Box for the first time in 20 years since he started woodworking. He asked Ninomiya the method many times. Hand plane was often used. At first, he tried to sharpen the hand plane well. It took around 3 months to make. Of course, it was made by “Denshou-Zukuri” to hide the bar well. It was hand-painted. Yosegi was offered by Ninomiya. The size is 5 sun, and it is 7 move. If he had made a standard Secret Box, he probably wouldn’t have had any difficulties like this time. 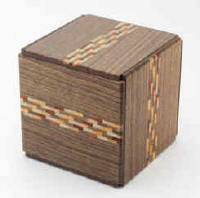 Material : katsura, magnolia, ancient katsura, etc. with Kagen Sound in 2014, and this new idea came to him. Well, is your Aquarius story happy or sad? 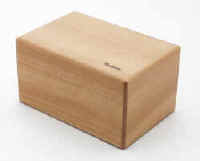 Confetto Box (RF-39) was developed systematically. A different maze was made on the same structure. The top links with the 4 sides. The bottom is the lid. The 4 side plates work with each other. The movement is only opening and closing, with no relation between the opposite sides, and only the top and sides link. In order to achieve these movements, I arrived at these designs. order to make a round, you have accomplished the goal. Of course, the top plate links, so it can’t be easy. You will be able to taste the real pleasure of Link Type well enough though. The total number of steps takes 13, and the extracted number of side movemenst is 4. Dare to say, this is a kind of “Straight Type”. advanced version of “Branch Type”. This is a kind of “Branch Type” puzzle. The route is symmetrical. The movement is standard as a “Branch Type”. But, an advanced Secret Shortcut technique is possible. The total number of steps is 21(normal), and extracted number of side movements is 7. In case you succeed at finding the Shortcut, the total number of steps will be reduced to 17. Though it might be more difficult… When I found the Shortcut skill I was excited and remembered NES. This is the only design that has a dummy movement among this series. The Dummy was made unavoidably due to structural reasons, but, it plays a big role later. This design may have the second highest number of steps. The total number of steps is 25, and extracted number of side movements is 10. This is a kind of “Turning Type” and takes 3 turns to solve. Maybe this design has the maximum number of steps to open. The total number of steps is 31, and the extracted number of side movements is 11. 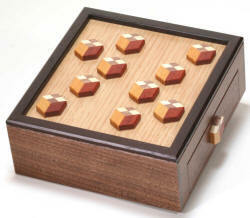 This is a kind of “Turning Type” puzzle and takes 3 turns to solve it. Will you see more of this kind of movement design in the future? and combined movement of the drawer and the red plate. 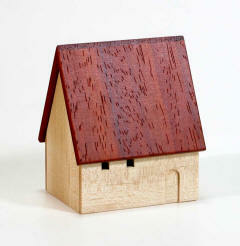 Sharp Roof House RF-48 An action of the development of “House Collection” Series started. The motifs are houses and buildings. 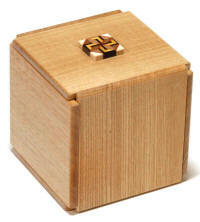 The aim is new style Karakuri box that is suitable to display or to put treasure inside. Basically, the Karakuri device is hidden in the design. This is a suggestion about new direction of Karakuri products. And, these items image “TAKUMI-KAN” that is a shop of wooden items in Odawara. This is the sixth item of House Collection. To say about Karakuri Box, when we got a new idea, we sometimes can not know how difficult to open it is for customers before making. How will the degree of the delicate tightness of the device influence it? How does the customers hold the box naturally? After all, we can not know it until we finish making. This item became one of such items. RF-47 An action of the development of “House Collection” Series started. The motifs are houses and buildings. 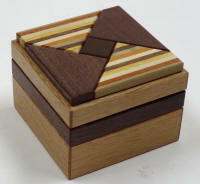 The aim is new style Karakuri box that is suitable to display or to put treasure inside. Basically, the Karakuri device is hidden in the design. This is a suggestion about new direction of Karakuri products. 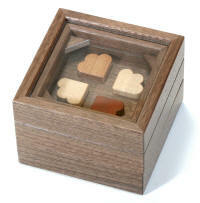 And, these items image “TAKUMI-KAN” that is a shop of wooden items in Odawara. This is the fifth item of House Collection. You can choose one color among four colors about the color of the windows. You need to solve this box to change the color. The cause of the imagination was House-shaped candlelight. A light leaks out from the window of the candlelight. It is very fantastic. 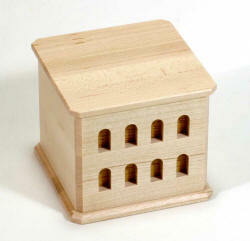 How can I reappear the atmosphere as a wooden Karakuri Box, without using the light? The designing of this item was not easy. But, it was very exciting time. 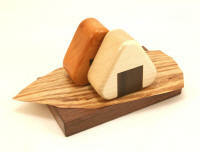 Design Housing RF-46 An action of the development of “House Collection” Series started. The motifs are houses and buildings. 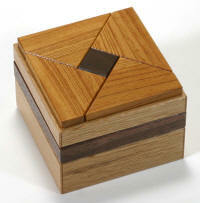 The aim is new style Karakuri box that is suitable to display or to put treasure inside. Basically, the Karakuri device is hidden in the design. This is a suggestion about new direction of Karakuri products. And, these items image “TAKUMI-KAN” that is a shop of wooden items in Odawara. This is the fourth item of House Collection. It is imaged a latest Design House. The device is hidden in the design. When you play with this item, you will not feel difficult to open. But, it can be difficult to find the solution from the appearance. It took double days in the production of the first lot. And then some kind of changes will be needed in the next production. Oops House RF-45 An action of the development of “House Collection” Series started. The motifs are houses and buildings. 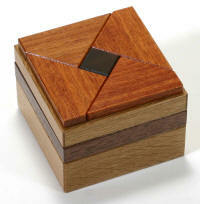 The aim is new style Karakuri box that is suitable to display or to put treasure inside. Basically, the Karakuri device is hidden in the design. This is a suggestion about new direction of Karakuri products. And, these items image “TAKUMI-KAN” that is a shop of wooden items in Odawara. This is the third item of House Collection. The House inclines. It seems to put the head on one side. There is a drawer inside. Of course, it is usually locked. However, you will be able to open it by doing a certain normal operation. The device which is used for this item is not newest one. But the device is relatively high level. This is an item that we can enjoy the device easily. RF-44 An action of the development of “House Collection” Series started. The motifs are houses and buildings. 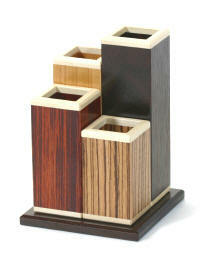 The aim is new style Karakuri box that is suitable to display or to put treasure inside. Basically, the Karakuri device is hidden in the design. This is a suggestion about new direction of Karakuri products. And, these items image “TAKUMI-KAN” that is a shop of wooden items in Odawara. This is the second item of House Collection. As a result, the device of this item is going to become the simplest among this series. The appearance became like this to make big inside space as much as possible, though this item itself is small. Now, when I finished making the first lot, I also have the feeling that I want to make with the sharper appearance in the next time. 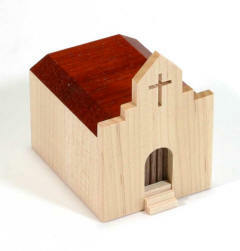 Church RF-43 An action of the development of “House Collection” Series started. The motifs are houses and buildings. 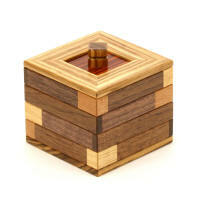 The aim is new style Karakuri box that is suitable to display or to put treasure inside. Basically, the Karakuri device is hidden in the design. This is a suggestion about new direction of Karakuri products. And, these items image “TAKUMI-KAN” that is a shop of wooden items in Odawara. This is the first item of House Collection. There is a drawer behind it. But, there is no handle on it. Well, how do you enter the church? It requires only one operation to open. takes 324 moves to open. You will be able to open the center box only when you move the five devices along each side in correct order. 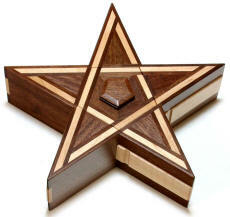 The hint of the order is cleverly hidden in the design of the inlay. It is an interesting item for the development of Karakuri. Generally, mechanisms that require one specific order to solve them tend to be complicated. This item is no exception. It may be said that the mechanism of this item is like a developed one of “Unusual Slot” (M-13) by Kamei. Bean Bag Drawer 2 RF-41 This work was designed as a Christmas present for 2015. This is a developed version of “Bean Bag Drawer (RF36)” that was designed in 2013. The goal is to find the hidden deep inner space of the drawer. You should move the four white plates in correct order. Of course, it’s not quite that simple to open – you also need to consider other ways it all fits together. 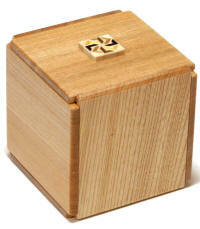 When you feel the spring start to shift, you will know that you have successfully found the inner box. Material : walnut, oak, maple, bubinga, magnolia, etc. This is a remake of Super-CUBI. Two surface plates are on opposite sides of each other; #1 and #2, #3 and #4, #5 and #6. 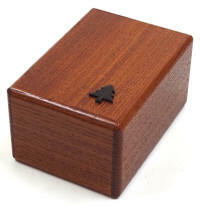 Material : shiuri cherry, walnut, etc. This work was designed for an exhibition that theme is “Two”. 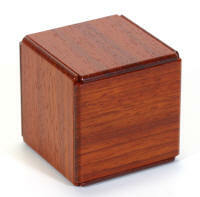 Of course, a normal Secret Box is a three-dimensional item. This item was expressed in two-dimensions. Even if the structure is made in two-dimensions, the inner space disappears. 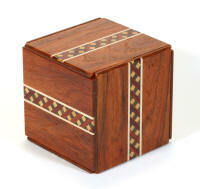 On the other hand, if it is made in three-dimensions, it becomes a normal Secret Box. Therefore, a structure that seems like it is between two-dimensions and three-dimensions was adopted. What does it mean? You will understand the Secret when you open it. 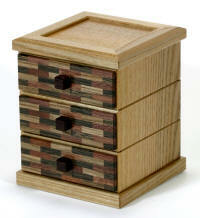 Material : sophora japonica, Japanese raisin tree, katsura, etc. RF-18-13 This is a remake version. The materials were changed. RF-18-12 This is a remake version. The materials were changed. RF-18-11 This is a remake version. The materials were changed. 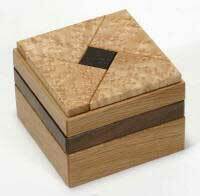 Material : oak, walnut, ancient katsura, etc. 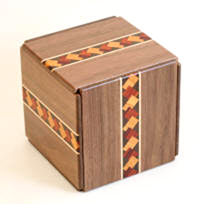 Confetto Box 2 RF-39 This work was designed as a Christmas present for 2014. This work was designed as a Christmas present for 2014. 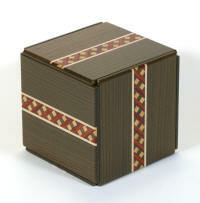 This is a developed version of “Confetto Box” that was designed in 2008. 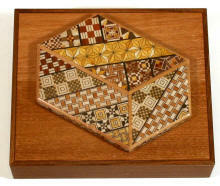 The original “Confetto Box” was solved by using 2 plates in a special way. This time, you can use the same method to open. But, you need another idea to open. Or, we had better to say that you need two more ideas? There in only one compartment inside. This was made based on a special order. There are many Karakuri inside. Memory System(RF-13), it’s Control Panels, Flue Pipes, Wind Control Boxes (boxes to make one way wind by both movement of opening and closing the drawers), Final Secret Drawer (it will be unlocked by a certain melody), A Door that will be unlocked by 8 step 2-ary (Binary) movement of drawers, A Door by 18 step 3-ary, A Door by 32 step 4-ary, and A Door by 50 step 5-ary. 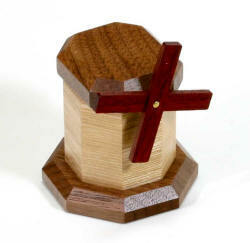 This item was ordered and designed under the influence of an item by Kagen Sound who applied a pipe organ to a puzzle in 2011. 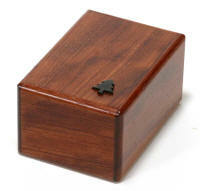 Material : Amboyna burl, Yanase Cedar, Shiuri Cherry, etc. Super-CUBI (small) RF-4-10 This Super-Cubi (small) was designed smaller than the original for special entry into the global ‘Apothecary Puzzle Project’. It involved 12 participants from 5 countries coordinated by Dave COOPER in Australia, with the carcass made by Robert YARGER in USA. In this small version some components were made from metal in order to accommodate the difficulty in making it this small. 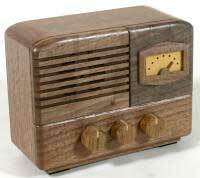 Antique Radio RF-37-1 This work was designed for an exhibition that theme is “Nostalgic”. 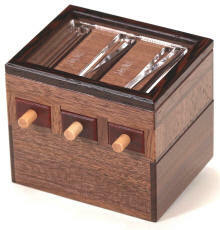 There are two compartments inside. One is under the speaker, and another is under the tuning meter. Please unlock each space with three dials. Each space unlocks differently. Please observe the radio carefully, and use that as a hint. 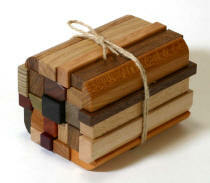 Material : walnut, magnolia, etc. 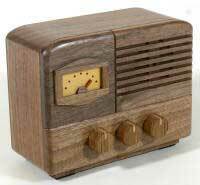 Antique Radio RF-37-2 This work was designed for an exhibition that theme is “Nostalgic”.This work is basically the same as RF-37-1. The difference is the position of the speaker and the tuning mater. When RF-37-1 was produced, only two copies of RF-37-2 were produced at the same time. Bean Bag Drawer RF-36 This work was designed as a Christmas present for 2013. The drawer is partitioned off. It is easy to open out halfway. Please open the drawer completely by moving the two devices. This work was named for the image of the solution by the craftsman. That might be your hint. This work was designed for an exhibition theme of "palpitate". This work was designed as a Christmas present for 2012. There are two compartments inside like RF-22. There is an A mark inside the first compartment and a B mark inside the second compartment. A is easy to open, but B is not. 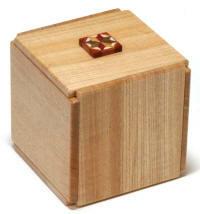 The idea of this trick is not the newest, but it was arranged systematically as a cube so that all the 6 aspects move. This is a remake version of Super-CUBI. To say about the surface plate, #1 and #2, #2 and #3, …#5 and #6 are neighbors each other. 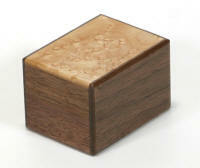 Material : walnut, keyaki (zelkova), etc. Wave Box (with a crayon) RF-33 This work was designed for an exhibition that theme was "living". There are 17 pieces of plates on the top of this work. Each plate works freely. While you open the drawer, the each plate will make an interesting move. The crayon put up in the edge of the work is a key of the drawer. This work isn’t difficult to open. What kind of image will be drawn with the crayon? 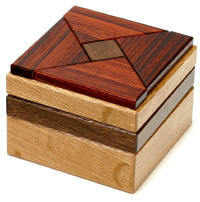 These are the remake version of the “Box with a tree”. The materials of the surface board were changed. As many of you know, the side plates must move in a special way. For this reason, more experienced skills are needed. The side plates were made somewhat loosely. Box with a tree　（chanchin） RF-14-6 This is the remake version of the “Box with a tree”. Box with a tree　（sophora） RF-14-7 This is the remake version of the “Box with a tree”. RF-18-8 This is a remake version. The materials were changed. RF-18-9 This is a remake version. The materials were changed. 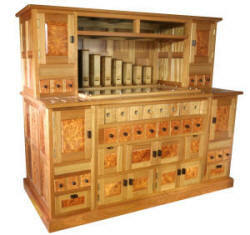 Material : oak, walnut, ancient kastura, etc. RF-18-10 This is a remake version. The materials were changed. Secret Base 2 RF-32 This work was designed as a Christmas present for 2011. This is a “Sisters work” of “Secret Base” (RF-18). The second compartment of the RF-18 is opened by a special operation. This work will be opened by same way. But, at first, you can’t do the operation. You need a new idea to do the special operation. There is only one compartment inside. RF-24-3 RF-24 was reproduced. The mechanism is same as the previous RF-24. You can unlock the drawers by sliding the body. The size became a little bigger. It became easy to make a little. The material was changed to oak. The oak is hard and you will feel that the work is solid and stable. The front design was also changed. 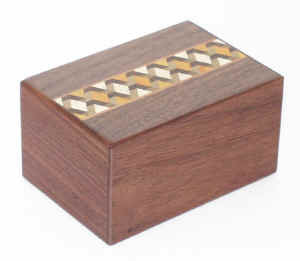 Material : oak, chestnut, corner stick of brass, and etc. RF-24-4 RF-24 was reproduced. The mechanism is same as the previous RF-24. You can unlock the drawers by sliding the body. The size became a little bigger. It became easy to make a little. The material was changed to oak. The oak is hard and you will feel that the work is solid and stable. The front design was also changed. Firewood RF-31 This work was designed for an exhibition that theme was "forest". The motif is firewood for fireplace. The trick is simple. When you move the trick, a drawer will come out. This motif "Firewood" was a trial for the craftsman. Over ten kinds of woods were used for this work. The materials are from all over the world. The work became a colorful work. In Japan, it is said to be a lucky knot. We can see it as a Chopsticks bag, and others. The craftsman wanted to make a work based on this shape. 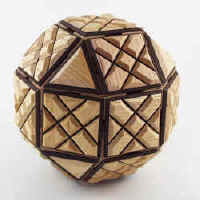 It has 19 moves, and the movements cross each other. It was much more difficult to make than expectation. Well, the shape of this "Chiyo-Musubi" is a Pentagon. But, it is also possible to make a Heptagon. Though, there is no plan to make it as a Karakuri work! （maple (birds eye)) RF-18-5 This is a remake version. The trick is same. The middle layer was made with a newly devised structure. The reason is to stable the layer as much as possible. The center part like a knob was also devised. Some customers put it upside down while playing. In fact, this how to put was unrelated to the solution. But, with this as a hint, at the copies of this time, it is related to the solution a little. This is by a slight playfulness. RF-18-6 This is a remake version. The trick is same. The middle layer was made with a newly devised structure. The reason is to stable the layer as much as possible. RF-18-7 This is a remake version. The trick is same. The middle layer was made with a newly devised structure. The reason is to stable the layer as much as possible. House with trees RF-29 This work was designed as a Christmas present for 2010. 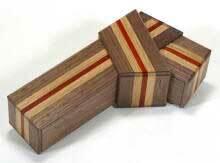 Do you know how to solve the "Box with a tree"? If you know how, then that becomes a hint. You can move the 4 plates freely. But, the top plate won't open. There are 4 trees on the top. 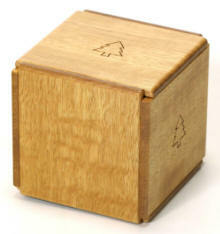 The direction of the trees are a hint in solving the box. 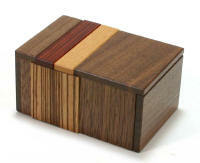 Material : false acacia, walnut, magnolia, angsana, keyaki (zelkova), zebra wood, ichii, acrylic boad, etc. This is the so-called "Quaternary Box". It takes 1536 moves to open. 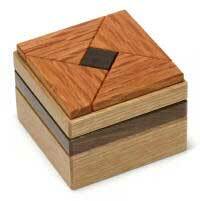 About ten years has passed since the creation of "Ternary Box". 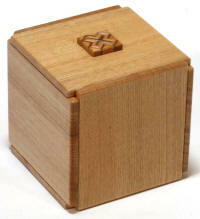 It was designed for the International Puzzle Meeting of 2010.
an “Odd Number Notation Box” is made of only “Snake”-shaped grooves. RF-27 This is the 4th type of the Byway Secret series. There are two compartments inside. Please try to find the second compartment. It takes 6 moves to open. 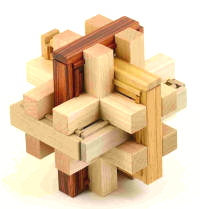 This work was designed for an international puzzle event that was held in 2010. Only about 10 copies were produced for Karakuri Club members. This work has the same mechanism as the RF-27. 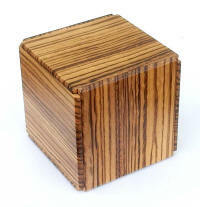 maple (birds eye) to zebra wood. “Three-color DANGO” equals three lines. The turn of the each DANGO’s color is different from the other. You can move each “Three-color DANGO”right or left. There are three drawers in the lower part. All the drawers are locked. The front boards of the drawers are colored the same as DANGO. Now, maybe you’ve already figured out how to play with this work. 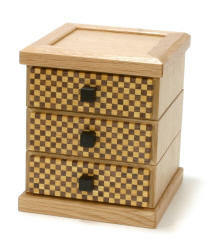 By moving each “Three-color DANGO”, please unlock the drawers. 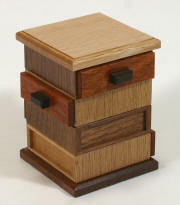 From a structural perspective, the drawers come out only 18 millimeters. Then, please take the front board off for the top. Oops. Don’t replace the front boards! RF-25 This work was designed as a Christmas present for 2009.There are 4 drawers. The direction of the drawers are all different from each other. Only the very bottom drawer isn't locked. 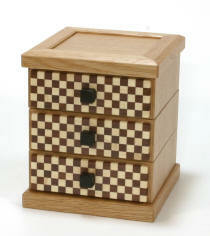 When you move the drawers in a special way, you will be able to open the drawers in sequence. The goal is to open all the drawers at the same time. A mechanism called, "prevention of countercurrent" was needed to make this work. The device is fitted only between drawers next to each other. 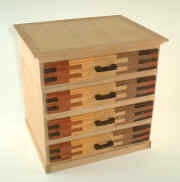 Therefore, it is possible to make a work that has 5, 6 and even more drawers, by piling up the same drawers in this work. 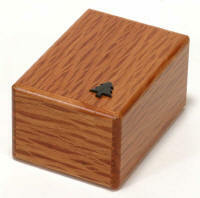 This work has a similar mechanism to that of RF-22 "Confetto Box". It is a remake version of the “Secret Base”. Only the material of the surface plates are different. The four plates of the surface are made of same color wood. The appearance became simple and refreshing. At first, you can't open the drawers at all. When you slide the drawers each other well, you will be able to unlock the key. 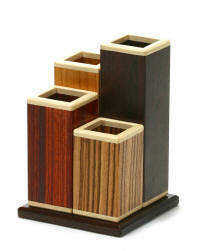 Material : amur corktree, chestnut, brass, etc. flower RF-23 This work was designed for the exhibition theme of “spring”. 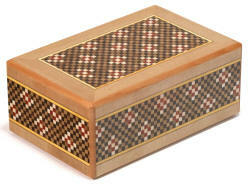 The motif is a Japanese traditional lunch box. There is an acrylic window board on top. You can see four pieces of scattered petals from the window but can’t touch them. The bottom layer is the base. The upper two layers is the cover. Of course, the cover is locked. From the base, you can move the cover from front to back and right to left freely. When you move the cover, each petal also moves. To unlock the cover, move the petals and make a typical “flower”. That is, you need to gather all the scattered petals togather. How do you do it? 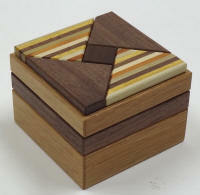 Material : walnut, birch, maple, acrylic board, etc. This work was originally made as a Christmas present for 2008, but after several years its now a mechanical piece. 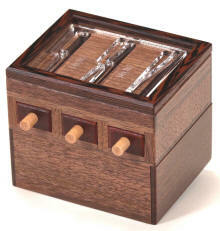 There are two compartments inside. The two lids are opposite each other. As you slide the four plates, the two lids can open. The first plate is quite easy to open, but you'll have to think about the second one! This is a work that you can use as a pencil stand. There is a small hidden space inside. It has 3 simple moves. But, it isn't difficult to understand it. Pencil Stand RF-21-2 The mechanism is almost the same as the RF-21-1. But, additional secret space was made. 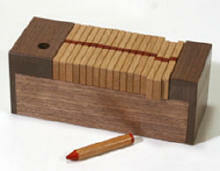 To maintain smooth movement for the future, 3 boards were glued to make the pencil stand’s board. The black color and the red color are easy to shift the colors to the white woods. The craftsmen worked hard to prevent it. The “Zebra wood” is easily broken in processing. Therefore, an unusual processing method was needed. This box opens with only one move. The cover rattles. But, the cover doesn't open even when you pull it up or turn any points of the box. It was unveiled at an exhibition that was held in Feb. 2008 by the craftsman and Mr. Ninomiya. At the exhibition, a customer who experienced Karakuri for the first time opened it very quickly, but a veteran of puzzles needed 30 minutes. This caused a lot of laughter! The acorn is made of wood. This work was designed for the marriage party of the craftsman's friend. RF-20-1 is a commercial version of it. Materials: oak, katsura, enju, etc. This is one of the works that were developed for the cause of the concept to "make works associated with Odawara and Hakone". In Odawara, there are fishing ports and we can have fresh marine products. "SUSHI" is a famous food of Japan. 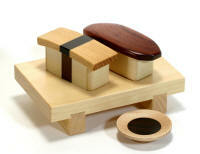 The idea of making "Karakuri SUSHI" has appeared repeatedly among Karakuri craftsmen, but, it has never been made. If you know the solution, it isn't difficult to open. Please find two spaces inside. The hints are "how to eat" and "how to hold" them. When RF-19-1 was displayed at the exhibition, the craftsman heard various comments from customers. “When we dip the rice into the soy sauce, the rice will fall apart!“, “I’ve never seen a square soy sauce plate!” Based on the opinions, RF-19-2 is a revision of RF-19-1. I studied so much about Japanese culture! Secret Base RF-18 It was created as a Christmas Present for 2007. The craftsman often watched TV robot animation. When a bad enemy destroys the town and the peace of the people, the shutter of a secret base that is hidden under the ground opens and a robot of the justice comes out to save the peace. It was an exciting scene. The shutter is the motif of this work. There are two spaces inside. Secret Base RF-18-2 This is a remake version of RF-18-1. The surface pattern was changed. The color of RF-18-1 was showy. The color of RF-18-2 is more subtle. Well, the design is not just a simple decoration. The inlay line is related to the device. You can see the read or orange lines. When you move the plates well, you can connect them. Then, you can open the second compartment. So, how do you connect the lines? ONIGIRI (Rice Ball) RF-17 The craftsman often had his mother cook ONIGIRI (a Rice Ball) when he was a child. He liked miso ONIGIRI and grilled ONIGIRI. Which kind of ONIGIRI did you like? The trick was made using the shape of the laver well. 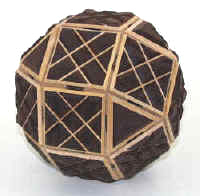 The two ONIGIRI are connected and move together. It has 5 moves. In addition, there are two extra spaces to be opened. This is a commercial version of RF-17-1. The mechanism is the same as RF-17-1. The traditional sheath under a real rice ball is "bamboo sheath" In both of the works RF-17-1 and RR-17-2, the "bamboo sheath" is made of the same wood. In the RF-17-1, it is very thin just like a real one. On the other hand, in the RF-17-2, the thickness of it is around two millimeters. It is stronger than the thin one. The size of the setting are a little different between RF-17-1 and RF-17-2. Covered Chimney RF-16 It was created as an Xmas Present for 2006. The theme of this work is the brick chimney that Santa Claus comes down. But, it is covered so Santa Claus can't come in. How do you open it? While you play with it, maybe you can find some hints to open the lid. In fact, the different color bricks is a hint. When you open it, maybe you can enjoy the transformation. 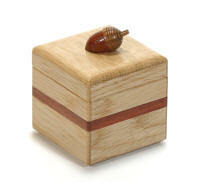 Material : katsura, walnut, berry, etc. Although most of his works have been rather complex and difficult, this time he created a work that has a simple device. Since the exhibition theme is "Valentine", he tried to make his work pretty. 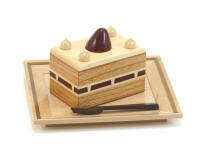 When you move the device correctly you will be able to separate the cake from the plate and find a small space inside. I believe while he was making this he must have been studying the design eagerly since he ate 7 or 8 kinds of shortcakes. Therefore the title 15 (ichi-go, one and five, also meaning strawberry in Japanese) seemed natural. Now this ichigo shortcake is in front of you, how do you begin to eat it? 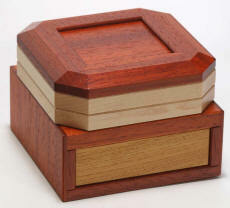 Material : Padauk, Dogwood, Zelkova, Maple, etc. Box with a tree RF-14 It was created as an Xmas Present of 2005. 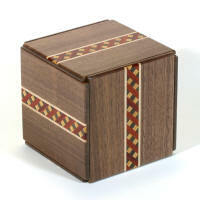 The appearance looks like a Secret Box, though there isn't any Mosaic pattern on the surface. On the top, there is a small decoration of a tree. You can find 2 plates you can move freely. Usually you move one plate at first. But, in this case that would be wrong. The important point is how to open the 2 plates. It takes only 4 ways to open the final plate. But, it may be difficult without knowing the solution. The small tree on top is also a hint. 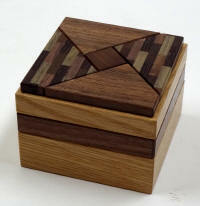 material : Japanese walnut, oak, acrylic board, etc. This is a remade version of a work that was designed for the 2005 Christmas present. It was made with different materials. It was made in one giant size. It has 4 moves. You need a special device to solve it. The decoration of the tree is a hint, too. 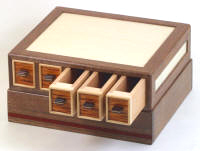 Memory Drawers RF-13 This work memorizes 120 (The factorial of 5) kinds of turn to open the drawers. The big base is full of 30 device plates. 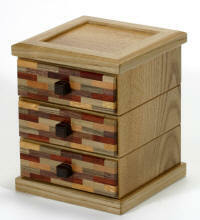 The plates move vertically and horizontally, and change the arrangements when you open or close the drawers. The work memorizes the turn you closed the drawers just before automatically, and change the turn to open the drawers next. In theory, 6 kinds / 25 plates are needed to realize this system. But actually, instead of that, 3 kinds / 30 plates are used. It’s a full-scale work that matches his previous “Super-CUBI”. The designer was eager to make it since he began to make Karakuri. It will be a most favorite work for the designer. Cage Burr RF-12 12 pieces parts moves on 12 pieces parts. 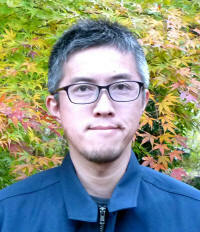 The base is "Akadama" of Hakone Works. Each part has a pin or a simple groove, and control the movement each other. But, I think it isn't difficult for puzzlers to put together. Maybe I can't say it's an pure interlocking puzzle, because I used pins. I think I can expect to apply this mechanism for another works. Byway Secret 3 (katsura, koyosegi) RF-11 This is the 3rd one of the Byway Secret series. For the present, maybe it's the last one of this series. I name it another name, "Wrong side secret." You can't see the decoration on it. But, it was designed like this on purpose. Can you imagine this meaning? There are 2 compartments inside. The first room is easy. But, it takes 21 moves to open the second room. I applied almost elements of traditional Himitsubako's main devices to my box. Byway Secret 3 (walnut, yellow-wave) RF-11-2 It's also a Byway Secret 3 that has different color, and same mechanism. 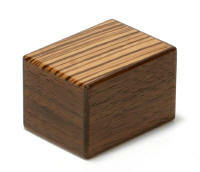 As the material Walnut is heavier than previous Katsura, it looks solid. 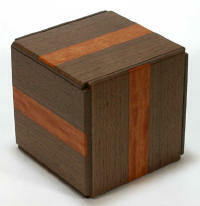 I'll explain about the inside of this box, you can find Yosegi inside. "ura" has another meaning and it's "inside out", in addition to "byway". and the surface pattern is also "insaide out" style. and you can see "wave (blue-sea-wave)" inside Bway Secret 3(walnut). 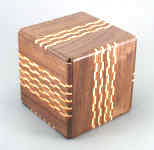 The yellow color is shine in the quiet walnut color. 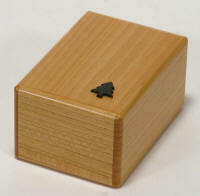 Pineapple Secret (twist, black) RF-10 It’s also a Himitsu-bako that has 18 plates and 33 moves. Of course, Then the movement is also different. The normal pine (RF-9) has a basic shape. But, this pine has another twisted shape. One sub mechanism is placed twistedly. Then those 2 sub mechanisms will obstruct the main mechanism at different place. 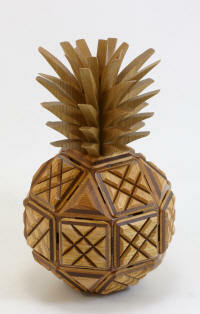 Then this arrangement makes the answer of this twist pine different between normal twist. RF-10-2 This is the commercial version of the RF-10 Pineapple Secret (twist, black). This is a Secret Box with 18 plate moves and has over 30 steps. The shape of the body is a twisted polyhedron. The movement is different from the RF-9-2. The mechanism was changed only a little from RF-10 just a small adjustment. The degree of difficulty in solving it will be almost the same as the RF-9-2. Pineapple Secret (normal, yellow) RF-9-2 This is the commercial version of the RF-9 Pineapple Secret (normal, yellow). This is a Secret Box that 18 plates moves and has over 30 steps. It was redesigned in various ways to improve the precision. The body size is smaller then RF-9. 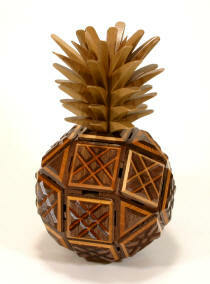 This time, the leaf was produced, and it looks like a real pineapple. At the RF-9, the leaf wasn't produced because of the schedule. Pineapple Secret (normal, yellow) RF-9 It’s a Himitsu-bako that has 18 plates and 33 moves. They move like “4 moves Himitsu-bako” as a whole. Well, there are 10 plates placed like a cross on right and left hemispheres. When you slide plates, the sub mechanisms will obstruct the main mechanism with a time lag. Then, you will have a hard time to open and close. Byway Secret 2 (yellow) RF-8-1 This is the 2nd version of the Byway Secret series. There are 2 rooms inside, and you'll be able to open the 1st room soon. But, it takes 10 moves to open the 2nd room, and you'll miss your way to open. 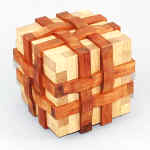 The right side and the reverse side will intertwine and move each other. 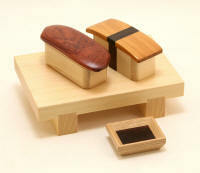 It was made with a new mechanism that is an application of traditional Himitsubako's bar device. 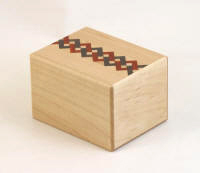 The difference between yellow one and red one is only the color of inlay on surface. They have same mechanism. 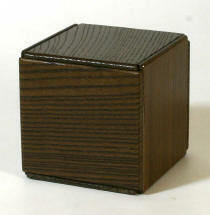 material : walnut, katsura, etc. Blue zebra RF-7 It's a puzzle version of dream of zebra. All the plate move same as the dream of zebra. But for example, it will be locked when you take mistake. You can't open it easily. 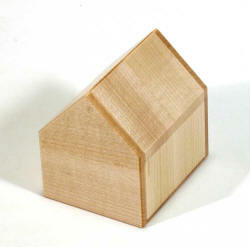 material : cherry tree, etc. 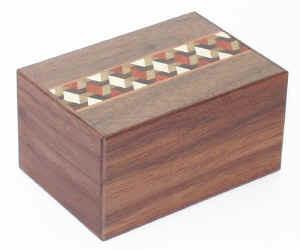 Byway Secret 1 RF-6 To say about traditional secret boxes, the outside plate moves. But, this is "Byway" type and It's new. Byway Secret 1 RF-6-2 The mechanism is same as the RF-6. The size of the appearance and the structure was changed. The box became stronger. Sliding 4 Drawer Chest RF-5 At first, you can't open the drawers at all. You can slide the drawers each other and unlock the key. 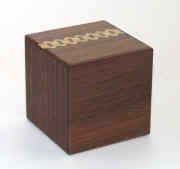 (the trinary system box) RF-4 This box is developed by one of CUBI (the binary system box made by Mr. Kamei) It has the trinary system in it. You can open it with 324 moves. But, you need 324 moves to close it again. It's the world record. I think, you need a little patience. It was named by Mr. Steve Barnett. 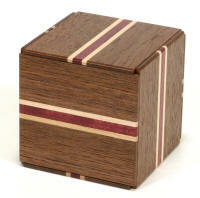 material : cherry tree, walnut, etc. 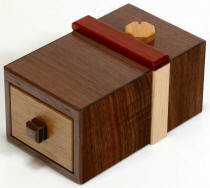 material : walnut, cherry tree, etc. 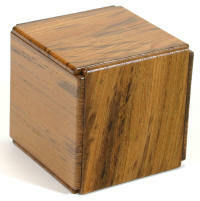 (the trinary system box) RF-4-3 This is a remade version of Super-CUBI. It has 324 moves. The motion is the same as the RF-4-2. 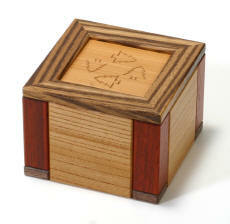 The word, "congratulation" was written on a small paper and put inside the box. What color is it this time? (the trinary system box) RF-4-4 It is a remake version of “Super-CUBI”. A regular customer cried, “I’m tired when I move 300 times!” The craftsman understood that. Therefore, this time, the new copies were adjusted a little loosely. Well, have you ever heard “Speed Cubing” of “Rubik’s CUBE”? It is a speed competition. Top players seem to solve it in about 10 second. It is a unbelievable speed. By the way, the craftsman sometimes tries “Speed Cubing” of “Super-CUBI”. Now, the looser adjustment is suitable. Until now, Feb. 2009, his best record is 43 seconds. But, the Contestant population is maybe only one. Everyone, please try! 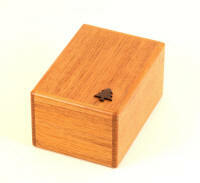 (the trinary system box) RF-4-5 They are remake version of “Super-CUBI”. RF-4-4、RF-4-5 and RF-4-6 have same mechanism, and different surface material. At the RF-4-1, #1 and #2, #2 and #3, …#5 and #6 are neighbors each other. At RF-4-2 and RF-4-3, #1 and #2, #3 and #4, #5 and #6 are in the other side each other. F-4-4, RF-4-5 and RF-4-6 are a type same as RF-4-1. The RF-4-1’s type is called “Twin Box Type” from Kamei’s “M-1-1 Twin Box”. From the #1, the turn is Up, Front, Left, Down, Back, Right. On the other hand, RF-4-2’s type is called “Bypath Type” from Kamei’s “M-11-2 CUBI (Bypath)”. From the #1, the turn is Up, Down, Front, Back, Left, Right. 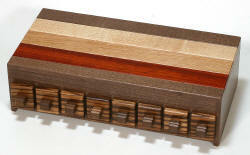 material : cherry tree, old keyaki zelkova), walnut, etc. (the trinary system box) RF-4-6 They are remake version of “Super-CUBI”. RF-4-4、RF-4-5 and RF-4-6 have same mechanism, and different surface material. At the RF-4-1, #1 and #2, #2 and #3, …#5 and #6 are neighbors each other. At RF-4-2 and RF-4-3, #1 and #2, #3 and #4, #5 and #6 are in the other side each other. F-4-4, RF-4-5 and RF-4-6 are a type same as RF-4-1. The RF-4-1’s type is called “Twin Box Type” from Kamei’s “M-1-1 Twin Box”. From the #1, the turn is Up, Front, Left, Down, Back, Right. On the other hand, RF-4-2’s type is called “Bypath Type” from Kamei’s “M-11-2 CUBI (Bypath)”. From the #1, the turn is Up, Down, Front, Back, Left, Right. 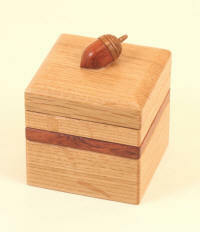 material : cherry tree, karin, etc. 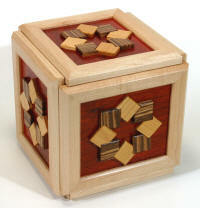 # Burr Puzzle RF-3-1 This is an interlocking puzzle. Put the 42 parts together. 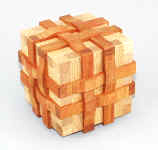 # Burr Puzzle(worm-eaten wood) RF-3-2 This is an interlocking puzzle. Put the 42 parts together. RF-1 This box has 12 plates. Each of the plates has the same shape, and the same pattern. One of them is a lid, and you can open it. But, you can't at first. At first, you move the 11 plates in turn. At last, you can open the lid as the 12th operation. The motion is simple and not so difficult. 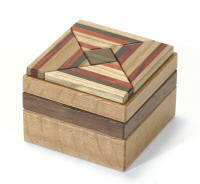 I wanted to make an unusual shaped box.